I'm the type of traveler who normally avoids museums. It is even more rare that I actually endorse a museum. With all the travel guides on the internet, no one needs me to tell them about the MOMA or the Met. But every once in a while I will find a place that is so fascinating, I have to write about it. 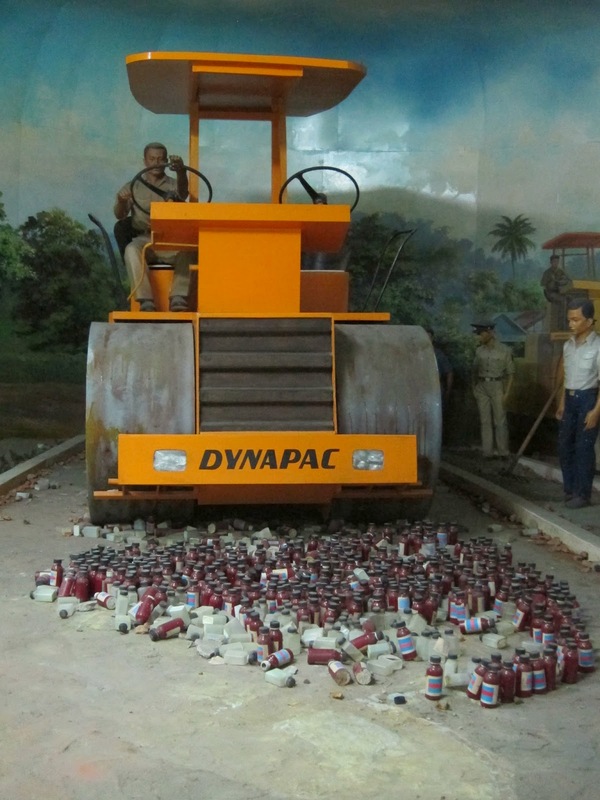 Yangon’s Drug Elimination Museum fits into that category. Actually, it defines that category. Partially designed to scare teenagers into not abstaining from drugs, and partially designed to flaunt the achievements of the regime, the Drug Elimination Museum is among the weirdest places our great planet has to offer. But as strange as it is, that’s how hard it was to find. I read that no cab driver will know its location, so it’s best to have it pinned on a map, and get dropped off somewhere nearby. Well, we decided to ride the Circular line northbound, jump off at a random spot (not even a proper station, just a place where the train stood still for a while), walk along the tracks until we found stairs leading to the street, then pull out Google Maps and try our luck. The pin on Google Maps was off slightly, leading us instead to a local TV station, then to an alley of apartments, then finally, as we were giving up and about to hail a taxi, we saw the entrance gate. The sign for the museum is completely covered in overgrowth from the trees that surround the property. The museum ground are a sight to see itself. Resembling an old colonial manor with impressive gardens, the building and gardens are now in a state of partial disrepair. Lit by the grey skies of a rainy afternoon, the scene was even more haunting. 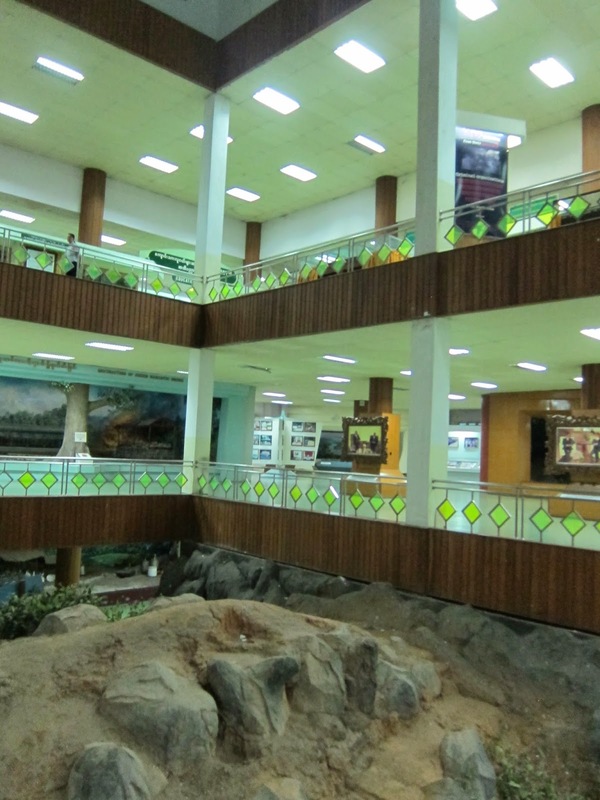 We bought our tickets from the reception desk at the entrance of the museum, paid for two adult admissions and a camera fee, which in total came to $12 or 12,000 kyats. Expensive by SE Asia standards, but totally worth it. After entering the museum, an intense thunderstorm broke out, and water leaked through the roof onto the third floor. The sound of rain and thunder echoed through the hallways, giving me the feeling of being in a haunted castle. In the center of the museum was an open space that spanned three stories. 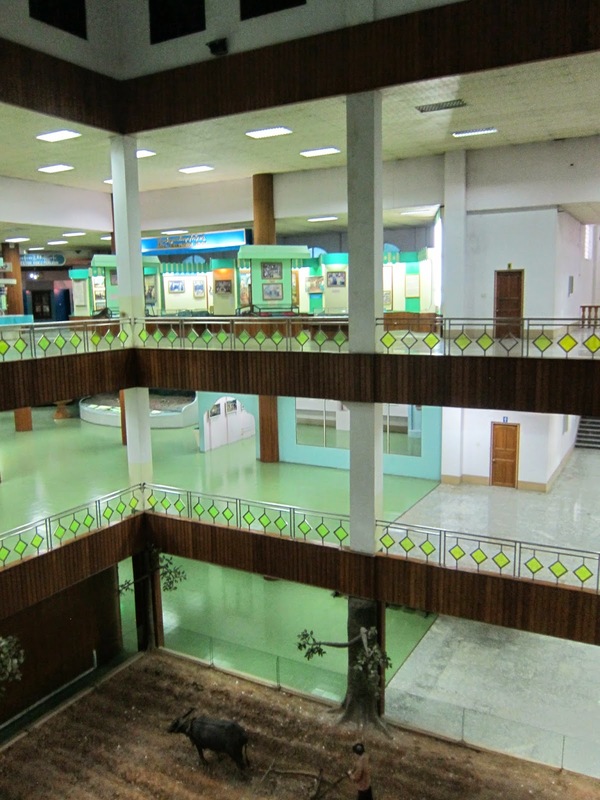 Normally the most impressive and eye-catching exhibit would be housed in the center, since it is the first things visitors see and is visible from all floors. Instead, the center exhibit consisted of a gargantuan farming installation, complete with fake trees and a puppet hoeing the plastic dirt ground. Most of the large scale exhibits show military operations, such as wars, and the destruction of farms that produce opium. However, as VICEmagazine pointed out, opium production has actually been increasing in Myanmar since 2006, a nice detail that was left out of the museum. The best exhibits are the interactive ones, in which you – the visitor - can do your part to stop the production and spread of dangerous drugs. 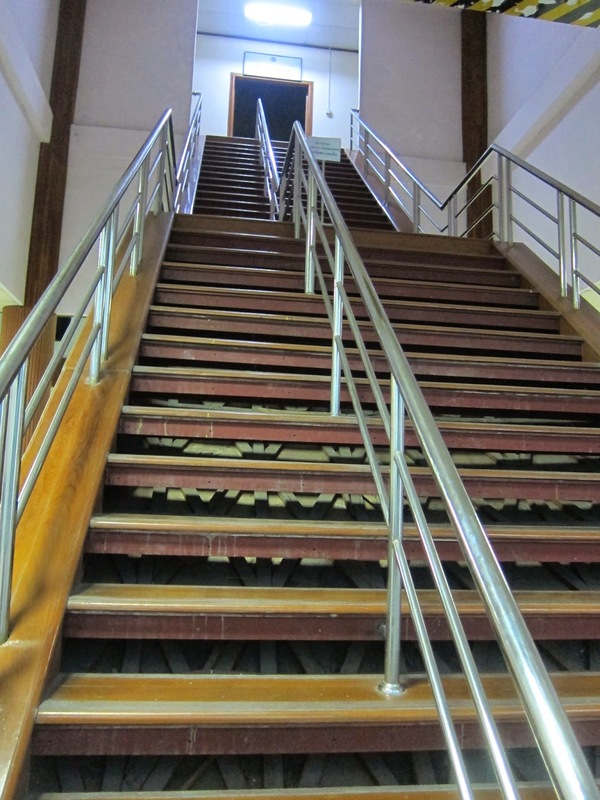 Besides flagrant propaganda and hokey exhibits, even more signs of unintentional weirdness can be found in the building itself. Large cobwebs hang from nearly every corner. Whole hallways and corridors are sectioned off and appear empty. It was obvious that this enormous manor had been constructed for some other purpose. An official government building? A plantation? Turning it into a museum was an afterthought. Like, “Oh we have this enormous building, what should we do with it?” The building was much too large for the exhibits it housed, and it seemed that many exhibits were created solely to fill space in the palatial halls, as observed through often boring and redundant exhibits about farming. All the dosets and staff, none of whom wore uniforms (so I can’t actually be sure they even worked there) congregated around the main reception desk on the first floor). Their loud conversation and laughter was something the only sound I heard in the halls of the museum. When it was time to leave I asked the museum if they could call a taxi – it was still raining hard and I didn’t want to walk down the long driveway to the main road to wait for a cab on the unsheltered sidewalk. This request ended up being a he party killer, and I soon learned that the museum lacked even a phone to make calls. Who had minutes on their cellphone? Who knew the number of a cab company? In the end, someone ended up using their cellphone to call a friend to pick us up and drive us into town for the honest price of 4,000 kyats, less than a cab would charge – in my experience. As we waited they brought out two more chairs and we all sat in a circle in the lobby, everyone chatting and laughing but us, who were simply nodding and smiling, unable to understand the jovial conversation. The funniest and most accurate account of the museum was written up in the Atlantic. After my trip to the museum I could not stop laughing at this article, but if you haven’t been there, it may not be as funny. 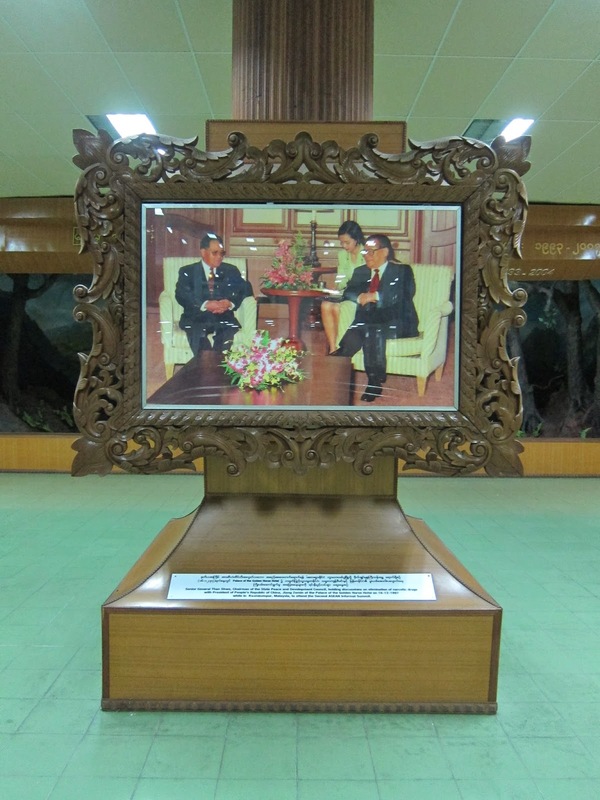 This museum is not to be missed if you are in Yangon and looking for quirky attractions. I don’t think I will ever go back, but I am certain I will see this place again in my dreams and nightmares.